DAVIE — Nesting loggerhead sea turtles in the northern Gulf of Mexico feed among areas that were oiled by the 2010 Deepwater Horizon spill and where human activities occur, several of which are known to pose threats to sea turtles, a new U.S Geological study showed. The feeding areas for 10 turtles overlapped with an area that experienced surface oiling during the 2010 Deepwater Horizon oil spill. These sites, and others, also overlapped with areas trawled by commercial fishing operations and used for oil and gas extraction. The study, which is the largest to date on Northern Gulf loggerheads, examined 59 nesting females, which scientists believe could be 15 percent of the breeding females in the Northern Gulf of Mexico—a small and declining subpopulation of loggerheads that is federally classified as threatened. “With such a large sample of the nesting females, we’re finally getting the big picture of when, where and how females that nest in the northern Gulf of Mexico rely on off-shore waters to survive. This information is critical for halting and reversing their declines,” said USGS research ecologist Kristen Hart, the lead author of the study. 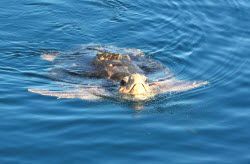 The study began in the wake of the Deepwater Horizon oil spill as a means to better understand how sea turtles used habitat in the Northern Gulf of Mexico by analyzing the movements of turtles tagged between 2010 and 2013. All of the turtles tracked in the study remained in the Gulf of Mexico to feed, and a third remained in the northern part of the Gulf. This differs from reports in other parts of the world, where some loggerheads have been shown to migrate across ocean basins after nesting.